For the use of ghee, oil in a like bread bread. 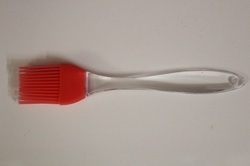 - Improve your cooking silicone brushes to your collection of cooking tools for ease and comfort. - Having the right equipment during cooking and baking increase the pleasure of the cooking experience by a hundred times over. One can avail from us a quality approved assortment of Silicone Oil Brush. Owing to their top quality, our products are extremely praised amongst the patrons. We offer the top series of Silicone Brush for our valued customers.